Blog Quick Quotes: Made in Minutes with Tanisha! Made in Minutes with Tanisha! Hey there, Tanisha here with a cute layout that I made in just minutes. Sometimes I run short on time and find that it's difficult to labor over a page. In those cases, I rely heavily on using quick and easy techniques to get a page done so I can move on to completing the million other things on my to-do list. I used One Fine Day to draw muted shades of colors from the photo. 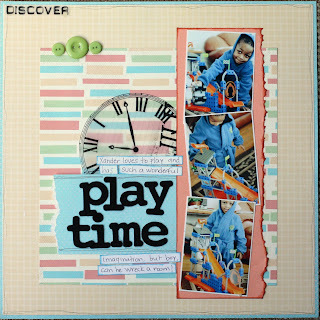 I cut the clock from vellum to help carry the theme of the layout and then added a little depth by inking the edges of the photo mat and added a little texture by using buttons and felt alphabet. Cute right? See, quick and simple doesn't have to be plain and boring!! love how you laid out the photos! great layout!!! very nice. Love all the colors. Love the large clock... It is perfect with the title!! Fun layout! !